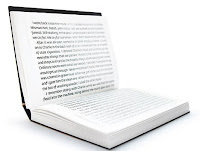 The new flipback format is trying to play on readers nostaligia for paper books, but trying to compete by reading sideways so it looks more like an ebook reader. At the best it's a throwback to the pulps of the 1950's people who want books are buying them for their longevity, or they are buying electronic. I don't know how they are going to get a Stephen King book in one of these "portable" volumes. 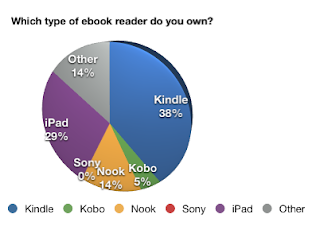 It's only sold 1 million copies in the past 2 years, and with the electronic "revolution" only getting stronger, I don't think this reaction to the decline of paper books is going to compete. I knew Many Genres, One Craft: Lessons in Writing Popular Fiction would be a treasure before I opened it. Hearing it described as a "writers workshop in a bottle" had piqued my interest. Now that I’ve gone through it, I can confirm it’s true. Any writer, beginner or otherwise will find benefit from reading this book. Usually structured around one theme, craft element or one particular way to write; how-to books can be limited on how much they can help you. Within all the sections, from idea generation to promotion of a published work is the wisdom of those who’ve “been there, done that” and are still publishing because they adapt to change, or newly publishing because they know what they are doing. Many of these contributors fondly reminisce on old times, when publishing was kind to writers. But, as Arnzen says in the intro, “Writing is a tough business and it's only grown colder as the trade has evolved.” And that’s why we need books like this. 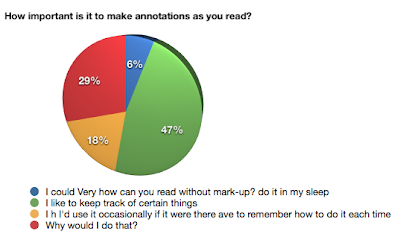 As you read you feel like the contributors are there talking with you. They are not saying “I’m a great writer I know how it should be done,” they are saying “I’ve been writing, and I discovered this.” These writers are not telling you absolutes, they are pushing you to develop your own judgment. As a writer, your strongest tool will be your own judgment: of your own work, and of what you read. If you read all these essays closely, you may find that some of the advice contradicts other pieces. This doesn’t mean one of them is wrong. One tidbit of hard-won industry knowledge may cancel out another bit of wisdom gleaned off an insider’s insight. But that doesn’t mean one is right and one is wrong. Both pieces of conflicting knowledge are important because they both happened. That’s the way it is. No one book can tell you everything you need to know to get published. But Many Genres, One Craft might be close. From MacWorld.com, "Online storage service Dropbox accidentally turned off password authentication for its 25 million users for four hours on Monday" They assert that less then 1% of their users were active at the time. Dropbox is a great utility for storing and sharing files remotely. You have a local copy of the file, and it is pushed to the cloud. Any other devices connected to that account, gets the file from the cloud automatically. Even with the privacy issue that was accressed, I use the service all the time. However, if you are storing sensitive files, it is always a good idea to ensure they are encrypted, no matter where they are stored. 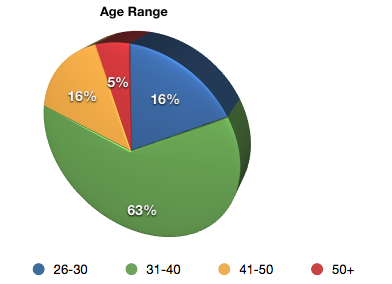 Today I want to show the last two pie charts, because they are so pretty to look at ... Umm, wait. Because they are a great way to show results. 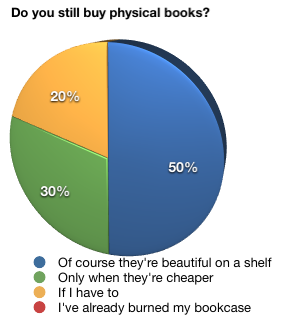 We'll save the textual results for part 4, where for instance, you will see what the most and least favorite features are. Now, let's have some more pie! For the most part, it seems pretty easy to load up the reader. Seems the companies have done their job. This one surprised me. When iBooks first came out, highlighting was a feature that was missing. 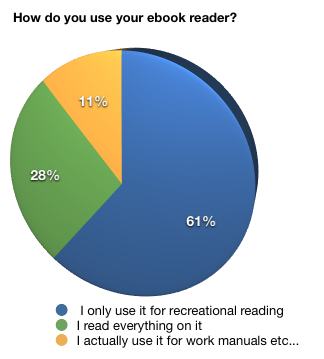 However it was available on the Kindle reader for iPad. It took one or two updates to get that feature into iBooks. It's a feature I just can't do with out. 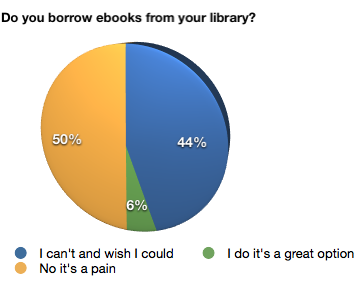 But I guess it depends on the type of book you are reading. 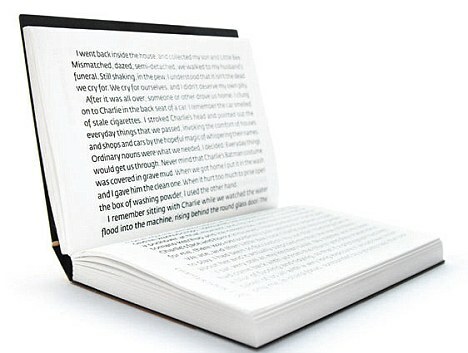 For a fiction novel, it doesn't make so much sense, but for a technical book, it makes all the sense in the world. 47% like the annotations, but 61% use it for recreational reading. So perhaps people like to highlight their favorite passages from their fiction books as I like to highlight important parts of a technical book. Look for the rest of the resulsts coming soon! Results are in! Congratulations to the winners, you have been notified via email. And now onto the Survey Results. We'll be releasing them in installments over the next few days. People still like to buy dead trees. They really are pretty aren't they? Nothing like showing off your fav books. 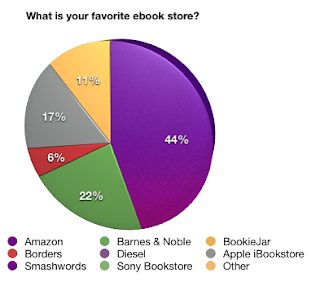 The folks at Apple know this, as the presentation of your ebook collection is a book shelf. Perfect. 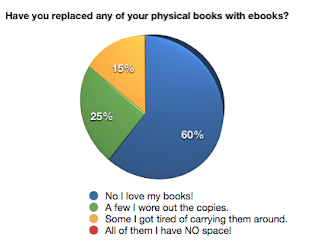 Not many have replaced their books with ebooks. I wonder if it would have made a difference if you were able to upgrade the print to ebook? Most of my technical books were O'Reilly, and they have an excellent replacement plan. If you have the print, you can get the ebook for a huge discount. Stay tuned for more results on Monday! Portland, ME June 17, 2011 It’s all about the technology. Literature has finally entered the Indie Revolution thanks to ebooks, and the Greater Portland Scribists aren’t hesitating to join. GPS has produced Scribings to get their bearings on the technologies that are bringing ebooks to the world. As new authors, they are experimenting with this low-cost, high-yield mode of publication to reach out directly to their audience. 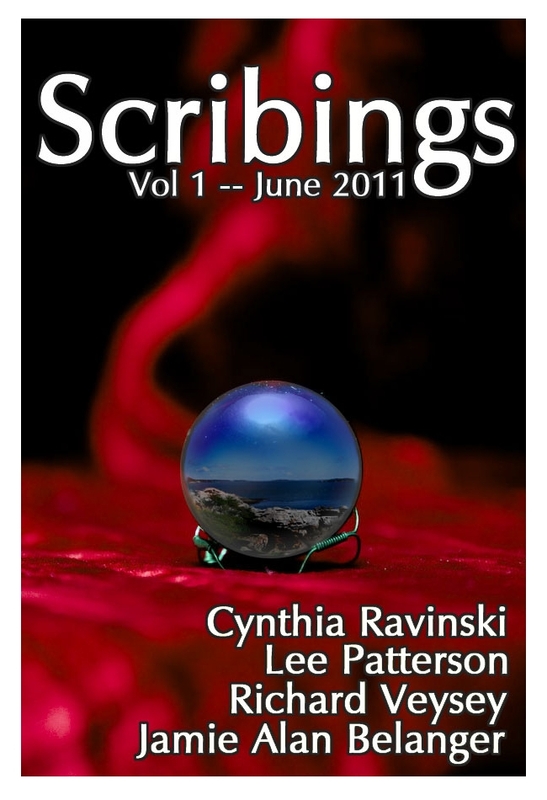 Find Scribings on Smashwords.com, and many other ebookstores, beginning June 17th 2011. Look for cards with discount codes circulating the Portland area! Scribings is a fabulous compilation of speculative tales by four Maine authors. The collection consists of eleven pieces of short fiction, including one piece of flash fiction from each author. 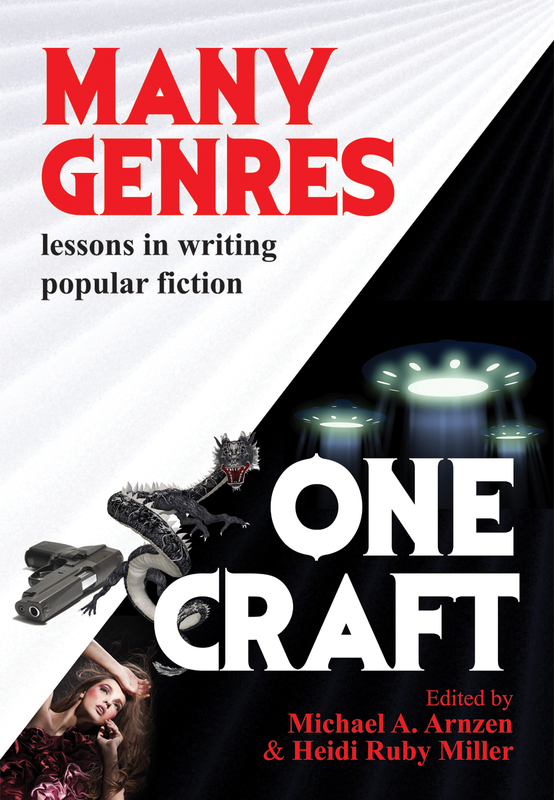 These stories exhibit a range of styles and genres from fantasy to science fiction and beyond. Watch young gods learn their place, see what the afterlife is like, meet Dappil, taste the sweetness of revenge, feel the fires of judgment and more. 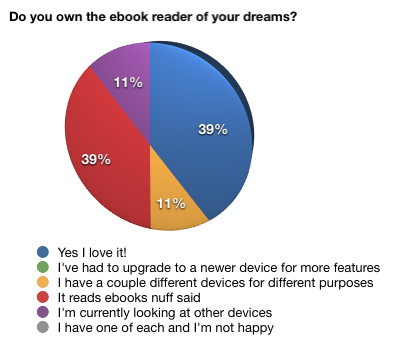 Over the last year GPS has been blogging about the development of ebook popularity and how epublishing is affecting the publishing industry. 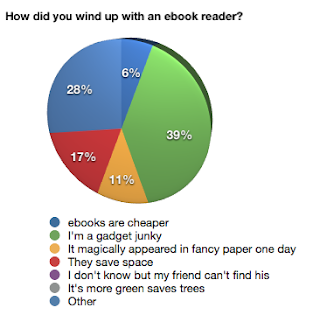 Also on their blog are reviews of writing software, book reviews and occasionally a free story. Greater Portland Scribists is a group of speculative fiction writers from the greater Portland, Maine area. They coined the term “scribists” to pay homage to the scribes of yore, monks who spent hours bent over manuscript pages, writing for as long as they had light to do so. GPS members are Jamie Alan Belanger; Cynthia Ravinski, MA; Lee Patterson and Richard Veysey. Just thought I'd pop in here and announce that we have a registered ISBN number! I used to be a panster. But I'm not anymore. I needed more structure to be productive enough to get all the work done that I want to get done. Yes, I’m an organizing freak, a slave to my left brain. But, I tried outlining and that didn't work. I wrote exactly what I should, and my work SUCKED.... So I do not outline. In my struggles with trying to trick myself into getting organized without outlining, I found something that did work. An old enemy had come back to offer help: the story arc. When I took my first creative writing class, for the first time in my life I started talking to a lot of the other people about writing. I didn’t know the jargon, outside of grammar and maybe plot. So when someone started talking about having trouble with a story because they couldn’t figure out the arc, I had no idea what he was talking about and thought he was being a writing snob and using a fancy word for the plot. Workshop after workshop I heard this word, “I really like the arc of your story,” etc…. And I was feeling left out. What was this ubiquitous arc? This was my situation: I refused to work off an outline, so I never wrote one. I had my synopsis but the ending I put down had nothing to do with my story anymore. But I needed something to point me in the right direction. I looked at the beginning, I looked at the middle...yes, there was a “shape there” I could feel it. But I needed to extend the shape. Then it clicked. It all fell into place. So simple. Why hadn’t I seen this before? The arc is, in a word, progress. It keeps the story from getting boring, from going in a straight line. You can think of it like a learning curve. At first you know nothing, but the more you learn the easier and faster you pick up this new thing until you know so much you can’t learn as much because there is less to know. You might say, “This resembles the shape of a story, rising action, climax, falling action and denouement.” Bingo. That’s exactly what it is. The thing is, I had seen this before. The arc I’d just come to terms with was easily recognizable in poetry. When I’d studied poetry with Wes McNair, he said a poem always has a turn. In class, we read some poems and found all the turns in them. I was hooked. My favorite poems are short lined with lots of enjambment. The turns in poems were always easy to find, for me (but not in a story, shrug). It always had something to do with the feel of shifting. is forced into frenzied life. I vastly expanded the shape of poetry that I loved so much to fit my novel. I finished it and moved onto revisions. By the time I got to the end, cutting passages, moving them around, heightening the action to give it meaning, I had a properly structured story, more importantly, I felt like I had control of it. Now, when I go to write a story, I need to have the arc in mind or I meander around and go nowhere, or I go everywhere except where I should. To keep organized, I use arcs to keep not only my plot on track, but also my characters. Writing is a craft. Like any craft its practitioners will improve and get better results with practice and the use of tools. This one magical tool has helped me resolve one of my biggest weaknesses. So, do you outline, write by the seat of your pants or, like me, something in the middle? *The turn occurs on line 13. See how it’s just after the middle of the poem? And then it moves on to the real kicker at the end—just like a story. 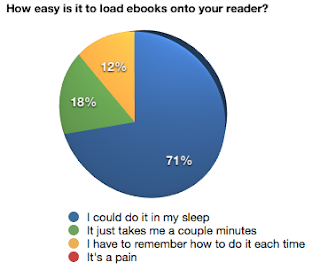 Own an eBook Reader? Click below to take our survey. 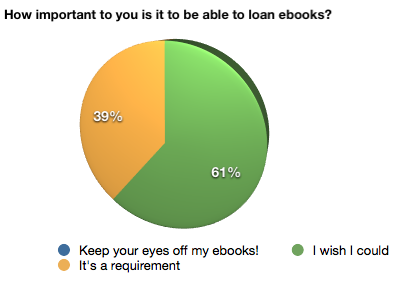 One winner will receive a $20 gift card to the ebook store of their choice and a free copy of our ebook. 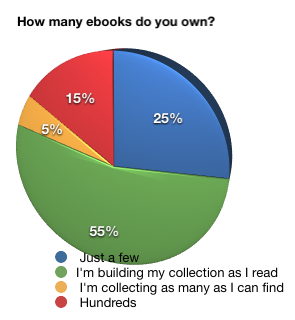 We'll give away five other free ebooks. Digital piracy. It's an illicit activity undertaken by college students in their dorm rooms or by teenagers in their parents' basements, right? 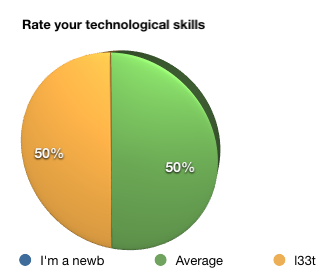 Wrong, according to a recent survey by the British law firm Wiggin. Or wrong when it comes to e-book digital piracy at least. I just read The Story of Stuff by Annie Leonard. We normally only review fiction as well as books on the craft of writing. But I read a lot of non-fiction as research for my Terran Shift universe, especially books I expect will help refine my vision of the future. The Story of Stuff is, by far, the most important book I've read in a long time. It's also the most depressing. The Story of Stuff is about all the Stuff we have in our society: cell phones, iPads, computers, books, toys, t-shirts, shower curtains, and all the other things we buy. The book charts the progress of that Stuff from ore extraction to product creation to garbage dumps. Many pages discuss the over-consuming society we live in (assuming you are in a first-world country like me) and how our current unsustainable lifestyle is destroying the planet, our communities, and ourselves. The Story of Stuff paints a sad picture of today's world. Eliminating hunger and malnutrition in the world would have cost $19 billion in 2003. In that same year, people in Europe and the United States spent $17 billion on pet food. Also in that year, people spent $14 billion on cruises, while a mere $10 billion would have given every person on the planet a year's worth of clean water. Toxic chemicals have been found in breast milk. These are chemicals linked to several neurological disorders and development problems. And, oddly enough, breast milk is still safer and better for your baby than the alternatives. How did this happen? The average woman in the US uses a dozen personal care products a day, containing 168 chemical ingredients, most of which are not actually regulated and many of which have been linked to cancer, reproductive problems, and disruption of hormones. And those chemicals pass from your body to your baby's. I've complained loudly, on several occasions, about products I purchased that were obviously engineered to fail - like that old DVD player with a 90-day warranty that stopped working on Day 91. Things like that are planned as part of the Stuff cycle - to force us to be good little consumers and buy replacements. Ever notice how all your fancy gadgets cannot be easily repaired? You can't even replace the battery in your iPod without minor surgery. "Upgrading" now means throwing the old one into the garbage can and buying a new one. Prices have been pushed so low that it's always cheaper to buy replacements than to have anything repaired. When my $250 printer runs out of toner, it will cost me $350 to replace the toner cartridges, and that's if I can even find someone to sell them to me. All planned as part of our consumerist culture. All these stories are linked if you follow the path of The Story of Stuff. This book is important. You need to read this book. It's eye-opening, often depressing, and simply outrageous. This book pissed me off (but in a good way). The saddest thing of all is that I know, as Ms. Leonard knows, that a few lifestyle changes I make to be "greener" won't matter much in the grand scheme. In fact, I think many of the solutions presented in the book are doomed to fail. Not for lack of intention, but simply because people are very attached to their Stuff and to their lifestyles. Many of the solutions come across as hippie lifestyle changes from the 60s. Granted, I believe these kinds of approaches are needed, and many of them coincide with my desire to live in a much smaller community, but I don't see the majority of people in the United States agreeing to them. We've had too many years of not trusting each other, not talking to our neighbors, just existing in our personal cocoons. I certainly don't see the corporations that benefit from this Stuff cycle relinquishing their control, or their money. While reading this book, I kept thinking of Tool's song Aenima: "The only way to fix it is to flush it all away." But maybe I'm wrong. Maybe if everyone who reads this review reads this book, watches the movie version, and talks about it... then maybe we can have a chance to save this planet (and ourselves!). Give it a shot. Turn off the TV, go to your local library or bookstore, and grab a copy of The Story of Stuff today.